23 year old woman with 70 pound weight loss. Before and 4 months following body lift and breast augmentation with 525 cc implants and lollipop lift. 30 year old woman with 100 pounds weight loss before and 9 months after breast augmentation with 500cc implants and lollipop lift, and abdominoplasty. 53 year old man who lost 180 pounds before and 4 months following a body lift. 54 year old woman following 80 pound weight loss. Before and 4 months after extended abdominoplasty and breast augmentation with 525 cc implants and donut mastopexy. 52 year old woman following 130 pound weight loss. Before and 4 months after extended abdominoplasty and breast augmentation with 425 cc implants and donut mastopexy. 46 year old female with 60 pound weight loss. Before and 3 months following body lift. 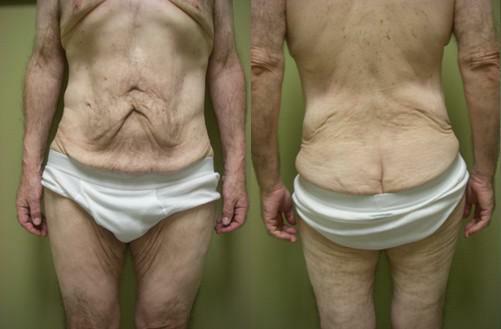 53 year old woman with 40 pounds weight loss before and 4 years after abdominoplasty. 33 year old woman with 100 pound weight loss. Before and 4 months after abdominoplasty, thigh lift and liposuction of thighs. 45 year old woman with 170 pound weight loss. Before and 5 months following abdominoplasty. 62 year old woman with 100 pound weight loss. Before and 5 months following medial thigh lift (previous body lift). 60 year old woman after secondary arm lift following 100 pound weight loss. 58 year old woman with 90 pound weight loss. Before and 5 months after extended arm lift and breast augmentation with 550 cc implants and lollipop mastopexy. 45 year old woman with 110 pound weight loss. Before and 4 months after breast augmentation and lollipop lift using 475cc saline implants. 41 year old woman following 125 pound weight loss. Before and 5 months after breast augmentation with 475 cc implants and donut mastopexy. 52 year old woman following 100 pound weight loss before and 4 months following extended brachioplasty. 44 year old woman with 100 pound weight loss. Before and 6 months following arm lift and 3 months following minimal incision breast lift and abdominoplasty. 44 year old woman with 350 pound weight loss. Before and 4 months following abdominoplasty. 41 year old woman following 120 pound weight loss. Before and 5 months following abdominoplasty and 15 months following brachioplasty.